Ajith Kumar had been suffering from some shoulder and leg injury for a very long time, but he kept resisting it due to consistent shooting of projects. He was also seen using the crutches to walk from place to place. Finally, with his recent release 'Vedalam' having witnessed blockbuster scenarios and all his works pertaining to the film completed, he had decided to get operated. 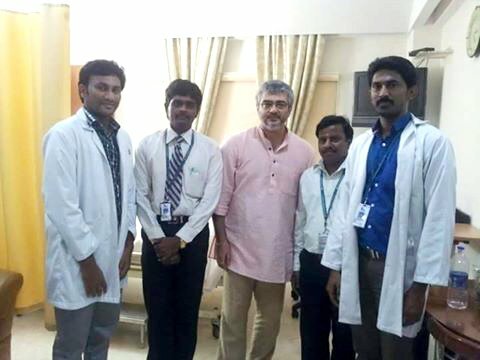 Ajith's surgery happened at a private hospital yesterday (12th November) for about six hours and he is said to be fine now. Last night, the surgery was done and now the actor's close source reveals that he is hale and healthy. One of the closest sources to Ajith Kumar on Twitter has written on the micro-blogging page saying, "Both leg and shoulder surgery are over. Thala Ajith is well in good health. Thank you for all your wishes and prayer." It is mentioned by some sources that Ajith Kumar will be going through a long phase of rest throughout this year and is planning to kick-start his next by June 2016. Sources already confirmed that Siruthai Siva once again will direct Ajith’s film and expect to start the shooting by June 2016.